It’s summer and vacation time. On a recent business trip to Philadelphia, I enjoyed a day to myself sight seeing the historic area of the city. The week before I was working in the picturesque beach community of Newport Beach in California featuring scenic views reminiscent of the Italian coast. Now I was back in time at Elfreth’s Alley. 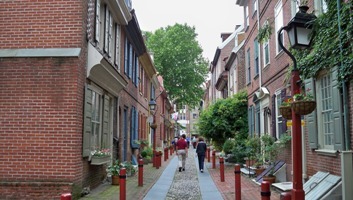 This neighborhood has the distinction of being the oldest residential community in our nation. The homes have been occupied since the early 18th century. As someone who appreciates colonial architecture, loves history, and is a professional organizer I can’t help but apprecite how our ancestors lived 250 years ago. Then beauty was appreciated along with simplicity. Walk-in closets, let alone most any closets, were not even in these homes. It’s a good thing Costco was not around in 1776. Research the city’s website before the trip. Keep travels to a limited area. Walk and take in the city. During lunch ask the wait staff what is not to be missed in the area. Don’t forget to use a Travel Checklist to keep from forgetting power chargers, reservation information, and other essential needs. For a complimentary checklist from Get It Together LA! click here and write Travel Checklist in the subject line. Now enjoy your next trip. This entry was posted in Office and Work, time management, Travel and tagged business trip, clutter, colonial architecture, Costco, Elfreth’s Alley, Get It Together LA!, organized travel, Philadelphia, travel, travel checklist on October 11, 2011 by Chris McKenry.